On March 23 at 0700 UTC (3:00 a.m. EST) the Visible Infrared Imaging Radiometer Suite (VIIRS) instrument aboard NASA-NOAA's Suomi NPP satellite provided a visible image of Caleb. 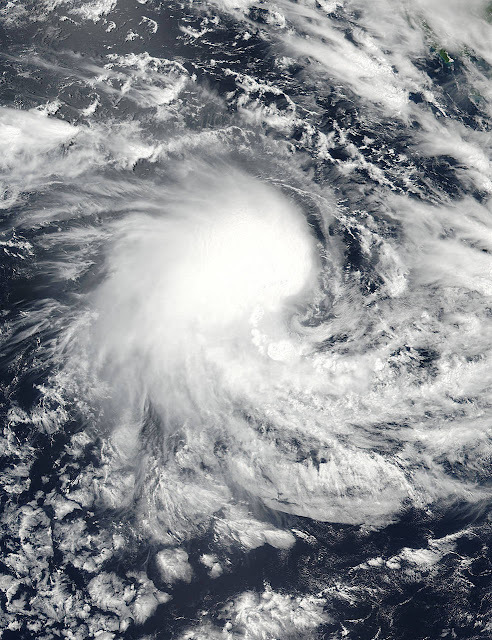 The VIIRS image showed most of the clouds and convection (rising air that condenses and forms the clouds and storms that make up a tropical cyclone) were west of the center, as a result of easterly wind flow. The Atmospheric Infrared Sounder or AIRS instrument aboard NASA's Aqua satellite looked at Tropical Cyclone Caleb in infrared light on Mar. 23 at 0729 UTC (3:29 a.m. EST). AIRS infrared temperature data showed some cloud top temperatures of thunderstorms west of Caleb's center were as cold as minus 63 degrees Fahrenheit (minus 53 degrees Celsius). NASA research has shown the storms with cloud tops that cold have the potential to generate heavy rainfall. Those storms were affecting Cocos Island at the time Aqua passed overhead. The Joint Typhoon Warning Center noted Caleb's formation at 0900 UTC (5 a.m. EST) when Caleb's maximum sustained winds were near 40 knots (46 mph/74 kph). Caleb was located near 12.4 degrees south latitude and 100.6 degrees east longitude. That's about 215 nautical miles (133.6 miles) east of Cocos Island. Caleb was moving to the southeast at 10 knots (11.5 mph/18.5 kph). The Joint Typhoon Warning Center forecast track takes Caleb southeast. It is expected to strengthen briefly, turn west and dissipate after five days.